Your maintenance may be complex. MainBoss is a simple and economical way to reduce your costs and manage your resources more effectively. 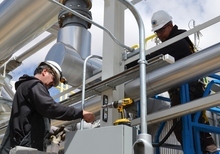 A CMMS software package gives you the information you need to get the most out of your maintenance department. For example, the software can keep track of preventive maintenance schedules, service contracts, problem reports, and material inventories. Managers can allocate people and equipment more effectively; workers can eliminate the headaches of wasted time and effort. For more about the benefits of CMMS, see Why Buy a CMMS? and What's in it for Me?. Which organizations can benefit from using a CMMS? What sets MainBoss apart from other CMMS packages? 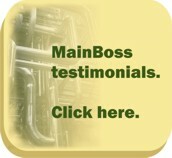 MainBoss is easy to use and easy to afford, while providing the bang for the buck that you need. To see just how simple and powerful MainBoss really is, why not check out Free MainBoss System. To that free system, modules can be added to increase the functionality of MainBoss. Note: CMMS packages may also be called Facilities Asset Management Systems (FAMS) or Facilities Maintenance Management Systems (FMMS). For more information on CMMS terms, see our glossary.